Very simple, yet very elegant looking. Has a very high end feel to the tub. The material of this tub is very high end and looks very sleek. Exactly what we were looking for! It is extremely heavy so make sure you have several people to get it into the house! 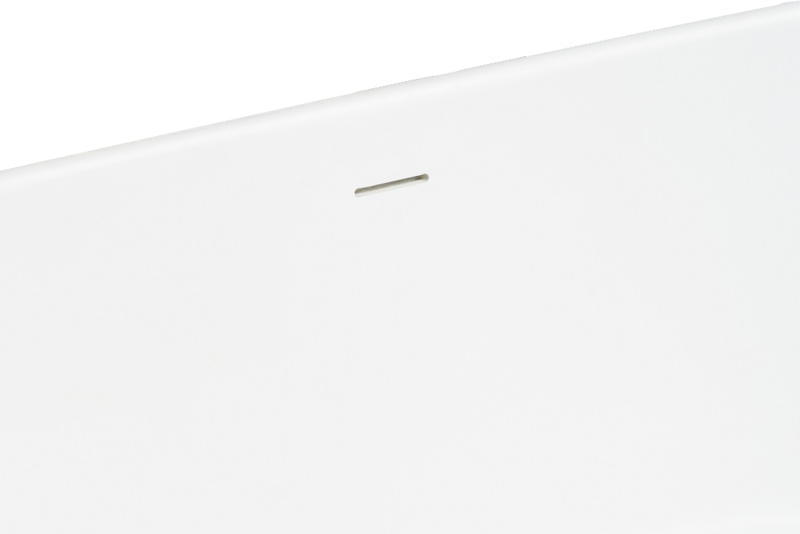 Pros: High quality material, excellent minimalist design. Cons: Not as white as I hoped but maybe just needs a cleaning. Love this tub! The plumber has not installed the tub yet, however it is waiting to be installed and looks gorgeous! Pros: perfect way to update your bathroom! 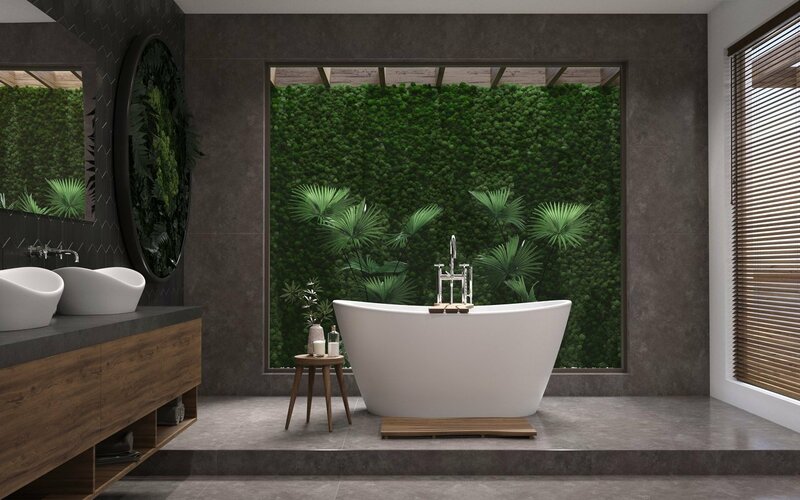 The tub looks beautiful and is made out of a artificial stone type material. Smooth and warm to the touch but is very heavy. the delivery company tried on two occasions to carry it up my stairs to the Master Bath and could not do it. They took it back and Wayfair issued a full credit to me. I found another tub on Wayfairs site called the Lugano that I ordered instead. It is acrylic, 1/3 the weight and price but looks very similar. Gorgeous tub! Delivery was great! We love the tub! But for future reference the tub specifications are off. It's a lot bigger than what the site has listed. We called in to let you guys know. We're just hoping now if we take off the door it fits because we love it. Incredible tub! This is such a beauty & it is deeper than you may expect which for us was great news!! The matte is absolutely lovely & it cleans nicely. Again, the price is so reasonable for such a high quality tub-it's very heavy & the finish is a perfect smooth matte white. Highly recommend! Ordered This tub for a client and it is amazing! Its beautiful, they material is really great the finish is smooth and easy to clean. The drain assembly that it comes with is actually one of the better pop ups/ or tub drains I've ever ordered. I sat in it as a test! and its superb for the comfort, and its beautiful! Best stand alone tub ever! This tub is solid curved and beautiful. It has a slant on the back when you are in the tub that makes it so easy to stay in there for hours. I was surprised how deep it is. It keeps the water up to your shoulders. Best Tub ever! 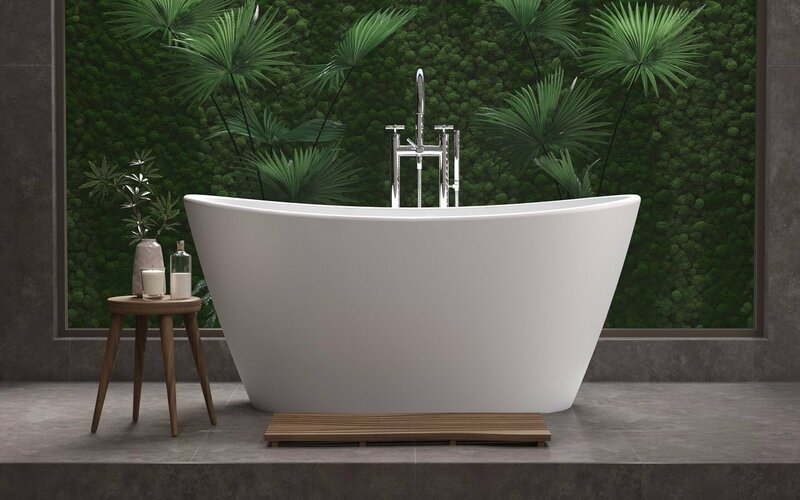 Incredible tub, looks wonderful, has a wonderful feel and very relaxing. Aqua Stone is great. Would highly recommend! Sleek, attractive boatlike design but no place to put your soap or bath additives. We have had this tub in our new bathroom for a few months now and absolutely love it. Despite what it might look like, this is not a small tub. I'm 6'2 and have plenty of space, don't even need to fill it up all the way. The material is really nice, it has a quality, nice and warm feeling to it. The tub is quite heavy, I wasn't home when it was carried up the stairs, but it supposed to have been quite a spectacle! I can definitely recommend this tub! Aquatica provided great customer service, and the tub is beautiful! It has a great solid feel to it, and most importantly my client loves it! They even did a great job following up to make sure everything went well with the installation. I would definitely use and recommend their products in the future. Best Soaker Tub EVER!!! I've had a few soaker tubs in my day and this one is by far my favorite! It is the perfect length with the perfect amount of angle to it for a comfortable lean/back support. I wouldn't say it holds 2 people comfortably like in the picture but it is a nice amount of space for one person. I also like a deep tub that I can fill up to my neck. The only thing to be aware of is that it does stain with anything that has a lot of dye in it. For example I dyed my hair and rinsed it in the tub. Unfortunately it left a dark brown spot in the bottom but I immediately filled the tub with some water mixed with bleach so it's only a faint spot now. But that is the only issue I've had and it was entirely my fault. So note, it is a bit porous but I would absolutely, without a doubt, buy this tub again! Nice Tub! I did a lot of research before purchasing a tub to make sure it fit the style and comfort needs I wanted. This tub does both really well. I take several baths a week to combat muscle soreness after running. I like this because it allows me to really stretch out my legs. Finally got it installed & love the look of it. I would probably look for one with a drain on the end so that if you accidently push down on the drain while soaking it doesn't pop up & start to drain. The other thing I would do is put the faucet the end of the tub & not in the middle cuz if you want to add more hot water while in the tub it doesn't burn you; if it is at the end of the tub it won't. Bathing luxury! A hassle free experience. Tub was packaged correctly, delivered on time, and is exactly what everyone deserves. Fits your body like a tub is supposed to. Beautiful tub! The material is so silky soft to the touch. Absolutely wonderful tub. 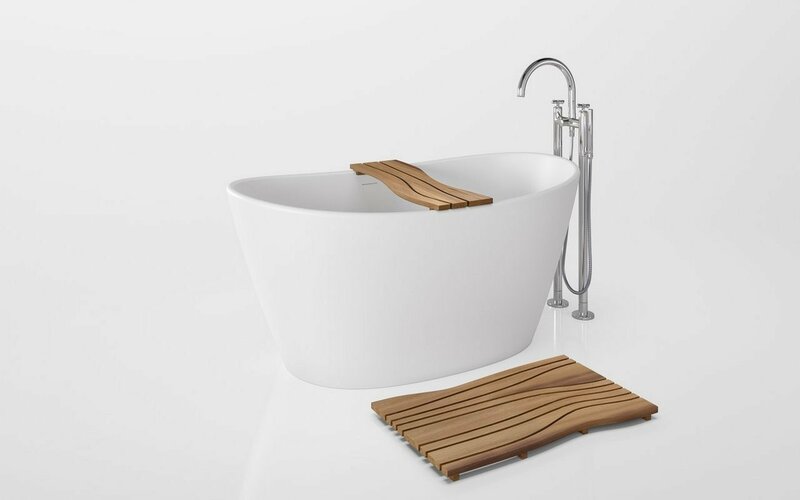 It feels great and the rounded edges are great for lounging in the tub. Beautiful shape. Water stays warm for over an hour without refilling.